“Stefan Lüddemann describes the Lingen-born artist Harry Kramer as “a deeply modern, because often broken and reflected artist role”. His work is characterised by several individual phases in which the sculptor, who never completed an artistic training, devoted himself entirely to one thing. Anyone who has kept Harry Kramer in mind knows above all his wire sculptures. Created between 1961 and 1967, he caused a sensation at documenta 3 with these “kinetic sculptures”: the body of wire mesh, in the form of a sphere, a cube, later also approaching a hand or a foot, a small cosmos of black, grid-like struts. A “system of moving elements”, connected by rubber bands that transmit the power of a small electric motor and, when it is switched on, keep the entire structure in constant motion. Jerkily, as if out of step, small balls sway, small wheels spin, tiny hammers strike bells, a restless buzzing in the wire rack. Within his work, however, these sculptures seem like the next logical step: From his mechanical theatre – an “eerie phantasmagoria”, a journalist of DIE ZEIT wrote in 1955 about the “13 scenes” shown in the Springer Gallery in Berlin – to the automotive figures, already incorporeal, and the short films with the same characters and their “bizarre comedy”, for which Kramer was awarded the German Film Prize and a Golden Lion at the Venice Film Biennale. From there it is not far to the wire sculptures of the 1960s. He also quotes them in the furniture sculptures of the later decade: everyday objects are combined with simple pieces of furniture, painted in bright colours and illuminated with isolated light bulbs. These objects as well as the “sliding sculptures”, organic forms with precisely fitted elements that can be shifted against each other, meet with divided opinions in the art world. Kramer “turns this bulky work of art into an object that is as pleasing to the eye as it is to the hand” and is dismissed by many as an attempt to finally be successful on the art market. In 1970, an incision is made in his work: he takes over the professorship for sculpture at the Gesamthochschule Kassel: “Not to show art, but to live it authentically” is his maxim. In the flat hierarchy of his class he subordinates his own production almost entirely to the collective, in this phase only a few works are created. Instead, he himself becomes a work of art: in the series “Artificial People” from 1972/73, two vending machines are exhibited, which are moulded according to his face and body. When you insert a coin, one moves the checked limbs, the other opens a small gullwing in his chest and plays a recording of Kramer’s voice. Almost 10 years after his arrival in Kassel, he again began his own project, the plates on the Apocalypse: on 24 plates are the texts of the Revelation of John, translated into a code of four differently coloured dots in acrylic. 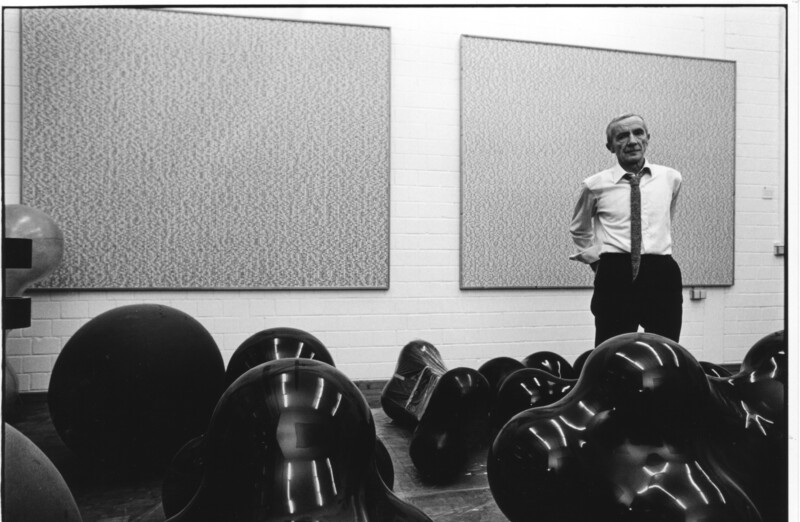 At the beginning of Harry Kramer’s 1995 retrospective in Lingen, these panels were integrated into a spectacular performance in which the artist was also present. On the gallery that runs through Hall IV lengthwise, they were displayed on easels and illuminated by 20 spotlights, the only light sources in the room. The spotlights of a truck lit the way for the visitors who entered the avant-garde jazz rock hall of the band “Ugly Culture” from Cologne. His last project was the necropolis in Kassel, an artist cemetery for renowned artists, which he financed to a large extent from his own capital and the sale of the Mechanical Theatre. Harry Kramer himself was anonymously buried on the grounds of the Hawk Forest. Harry Kramer was born on 25 January 1925 in Lingen, in a poor environment in which his parents prophesy a life as a street sweeper because he is not master of German law. When he was seven years old, his mother died of tuberculosis. Then the slender boy Harry withdraws into his innermost being and, looking back on this time, later calls himself an impostor. After training as a hairdresser and military service, he worked for four years as a dancer and actor before starting work at the “Mechanical Theatre” in 1952. In 1956 he moved to Paris, followed by stays in the USA, exhibitions and a guest lectureship at the Hochschule für Bildende Künste Hamburg. From 1970 to 1992 he taught sculpture at the Gesamthochschule Kassel, where he opened the Kassel Necropolis in his last year. On February 20, 1997, Harry Kramer passed away in Kassel.